Both warts and moles are skin conditions which can look similar, but they are totally different skin conditions. They are both annoying things to have on your skin, as most of us wish to have clear flawless skin. 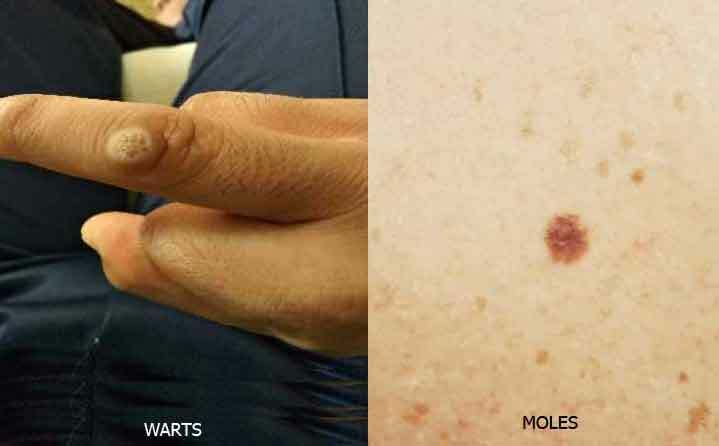 Both moles and warts can develop in a single individual. People always search for the best way to remove warts or moles. Warts are small growths which are skin colored (but can appear pink, tan or white), fleshy and rough to touch. They occur commonly on your fingers, hands, feet, legs and also in palms and soles. When looked closely there are tiny black dots on top due to clotted small blood vessels. Warts are caused by the Human Papilloma Virus. It is an infectious skin condition which can be passed from one person to another by touch. Warts are harmless. They commonly go off with time on their own. The wart occurs at the site where the virus entered the skin and new warts can appear when it spreads to other regions of your body. The best way to remove warts is mentioned below. Although you can leave warts alone as they are harmless, you may want to get rid of them as it might be an embarrassing thing to have. Garlic paste, raw potato juice or apple cider vinegar can be applied over the wart and covered with duct tape, will soften warts. This, although helps, is not a proven remedy and is time-consuming as this method should be applied for some time. How to get rid of skin tags and moles? Application of topical solutions containing Salicylic acid – Salicylic acid is a keratolytic (peeling medicine) which removes dead skin. This has to be applied regularly for a long period. Make sure that the liquid is applied only on the wart and not over the surrounding skin as it can burn the normal skin leading to damage. Applying salicylic acid will burn the wart and peel off the layers of skin covering the wart gradually. Read the instruction leaflet carefully before use. When there are multiple warts and if they are spreading – it may point towards a weak immune system in you. The doctor may prescribe a higher strength of salicylic acid (50%) to apply over warts. Cryotherapy – The doctor will use liquid Nitrogen to burn warts and freezes them. A blister will form and the wart is sloughed off with it. Minor surgery and LASER can also be tried for warts which are unresponsive to topical therapies. They are painful methods and a scar may be left, which is an undesired feature. Moles are small, brown spots which are a common type of growth on the skin. They are formed of melanocytes (pigmented cells). They usually appear in children and young adults and may continue to adulthood. Moles can be caused by excessive sun exposure or due to genetic predisposition. They can run in families. They are round or oval in shape and less than 6 mm in diameter. Most moles have hair growing from within. 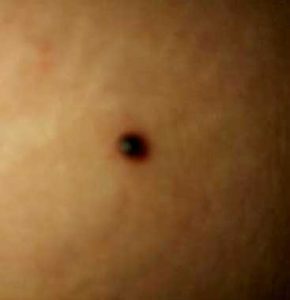 Moles can occur anywhere on your body. Many people have up to 40 moles. They can grow bigger and darker due to hormonal changes as in puberty and pregnancy. Some moles will go away with time. Regular or common moles are harmless; however, they should be monitored with caution, as they can become atypical any time. If a mole changes its appearance in size, color, shape, and speed of growth, it is called an atypical mole. It can be a warning sign that the mole is turning in to a Malignant Melanoma (skin cancer). If detected it should be removed as early as possible to prevent it turning in to cancer. How to identify a Malignant Melanoma? If you find any of these features happening in your moles, it is a must to seek help from a dermatologist. Most moles do not need any treatment, as they are harmless. If you are not cosmetically concerned, you can leave them alone. They may fade away with time. But you should be cautious and monitor them often for changes in size, shape, color and growth rate, to prevent it from turning in to skin cancer. How to get rid of skin tags and moles with home remedies? Apply a freshly cut garlic clove, apple cider vinegar or baking soda and castor oil paste daily to gradually remove your moles. Both regular (common) moles and warts are harmless. If you allow time, both moles and Warts will go away on their own gradually. Moles have melanin pigment in it as it is formed by melanocytes (pigmented cells). But Warts do not have pigment and it is commonly skin colored. Moles can have hair grown on top of it but Warts do not have hair. Regular moles are harmless, but due to its pigment, there is a rare chance of it turning in to a Malignant Melanoma (the type of a skin cancer). Warts never turn in to cancer. Warts can appear on palms and soles, over fingers, knees etc. But moles do not appear on palms and soles. Cause of a viral wart is a virus called Human Papilloma Virus. So it is contagious. That means you can get it from a person with warts through touch. Moles are not infective. Skin contact doesn’t make you get moles. As warts spread due to the multiplication of the virus to other areas of the body and there is a risk of infecting others who you come in to close contact with, it is best to seek treatment. However, moles can be left alone, if you are not cosmetically worried unless they change in appearance to become an atypical mole. Moles can be genetic and can run in families. Warts are not genetic, although can develop in family members because spreading of infection from one to another due to the close association. Moles can develop due to excessive sun exposure. But Warts are not related to the sun. Moles can be flat or raised, brown in color and round or oval in shape. Warts are small, irregular fleshy skin-colored growths. Are you still searching on how to get rid of skin tags and moles? Don’t give yourself a second chance. Download our app to get instant solution. Great article. Thanks for sharing! !